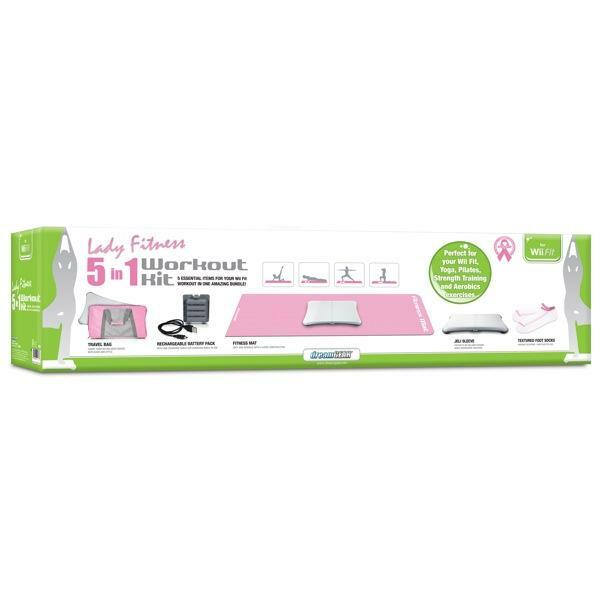 dreamGEAR's 5-in-1 Lady Fitness Workout Kit is the perfect solution for the active Wii Fit gamer. It has all the essential items including, a Rechargeable Battery Pack to keep your Wii Balance Board ready for use, a Jeli Sleeve that adds traction and protection, a Travel Bag for portability, Textured Socks for added grip and a Fitness Mat. The Fitness mat can also be used for your regular Yoga or Pilates exercise routine. Get everything you need for your Wii Balance Board in this amazing bundle!! Protect your Wii Fit Balance Board but share it with friends by carrying it with style in the custom fitted Travel Bag. The Fitness mat gives you the freedom to perform all the positions your workout requires. Add grip and protection to your Wii Balance Board with the Jelli Sleeve. Play whenever you want with the Rechargeable Battery Pack plugged in! The Textured foot socks not only provide control and stability, but are custom designed to match the Wii in style! Portability, comfort, freedom, protection, control, stability and power -- the 5-in-1 Fitness Bundle for Wii Fit has it all!